Boating is the leisurely activity of travelling by boat, or the recreational use of a boat whether powerboats, sailboats, or man-powered vessels (such as rowing and paddle boats), focused on the travel itself, as well as sports activities, such as fishing or waterskiing. It is a popular activity, and there are millions of boaters worldwide. Recreational boats (sometimes called pleasure craft, especially for less sporting activities) fall into several broad categories, and additional subcategories. Broad categories include dinghies (generally under 16 feet (5 m) powered by sail, small engines, or muscle power), paddlesports boats (kayaks, rowing shells, canoes), runabouts (15–25 ft (5–8 m) powerboats with either outboard, sterndrive, or inboard engines), daysailers (14–25 ft (4–8 m) sailboats, frequently with a small auxiliary engine), cruisers (25–65 ft (8–20 m) powerboats with cabins), and cruising and racing sailboats (25–65 ft (8–20 m) sailboats with auxiliary engines). The National Marine Manufacturers Association, the organization that establishes several of the standards that are commonly used in the marine industry in the United States, defines 32 types of boats, demonstrating the diversity of boat types and their specialization. In addition to those standards all boats employ the same basic principles of hydrodynamics. Yacht clubs and marinas are centers of boating activities – Yacht Harbour Residence "Hohe Düne" in Rostock, Germany. Paddlesports include ears (lakes), swiftwater (rivers), and oceangoing types, usually covered-cockpit kayaks. Canoes are popular on lakes and rivers due to their carrying capacity and efficiency on the water. They are also easy to portage, or carry overland around obstructions like rapids, or just down to the water from a car or cabin. Kayaks can be found on calm inland waters, whitewater rivers, and along the coasts in the oceans. Known for their maneuverability and seaworthiness, kayaks take many shapes depending on their desired use. Rowing craft are also popular for fishing, as a tender to a larger vessel, or as a competitive sport. Rowing shells are extremely long and narrow, and are intended to convert as much of the rower's muscle power as possible into speed. The ratio of length of waterline to beam has much importance in marine mechanics and design.. Sailing can be either competitive, as in collegiate dinghy racing, or purely recreational as when sailing on a lake with family or friends. Small sailboats are commonly made from fiberglass, and will have wood, aluminum, or carbon-fiber spars, and generally a sloop rig (two sails: a mainsail and a jib, commonly include 3rd sail the spinnaker for going downwind). Racing dinghies and skiffs tend to be lighter, have more sail area, and may use a trapeze to allow one or both crewmembers to suspend themselves over the water for additional stability. Daysailers tend to be wider across the beam and have greater accommodation space at the expense of speed. Cruising sailboats have more width, but performance climbs as they tend to be much longer with a starting over-all length of at least 25 feet (8 m) re-balancing the dynamic ratio between length of waterline (aiding speed) and beam width (adding cargo and people space). Freshwater fishing boats account for approximately 1/3 of all registered boats in the U.S., and most all other types of boats end up being used as fishing boats on occasion. The boating industry has developed freshwater fishing boat designs that are species-specific to allow anglers the greatest advantage when fishing for walleye, salmon, trout, bass, etcetera, as well as generic fishing craft. Watersport Boats or skiboats are high-powered Go-Fast boats (specialized towboats in fact) is designed for activities where a participant is towed behind the boat such as waterskiing and parasailing. Variations on the ubiquitous waterski include wakeboards, water-skiing, kneeboarding, inflatable towables, and wake surfing. To some degree, the nature of these boating activities influences boat design. Waterski boats are intended to hold a precise course at an accurate speed with a flat wake for slalom skiing runs. Wakeboard boats run at slower speeds, and have various methods including ballast and negative lift foils to force the stern in the water, thereby creating a large and "jumpable" wake. Saltwater fishing boats vary widely in length and are once again specialized for various species of fish. Flats boats, for example, are used in protected, shallow waters, and have shallow draft. Sportfishing boats range from 25 to 80 feet (8 to 24 m) or more, and can be powered by large outboard engines or inboard diesels. Fishing boats in colder climates may have more space dedicated to cuddy cabins and wheelhouses, while boats in warmer climates are likely to be entirely open. Cruising boats applies to both power and sailboats, and refers to trips from local weekend passages to lengthy voyages, and is a lifestyle. While faster "express cruisers" can be used for multiple day trips, long voyages generally require a slower displacement boat (trawler) with diesel power and greater stability and efficiency. Cruising sailboats range from 20 to 70 feet (6 to 21 m) and more, and have easily managed sailplans to allow relatively small crews to sail them long distances. Some cruising sailboats will have two masts (ketch, yawl, or schooner rigs) to further reduce the size of individual sails and make it possible for a couple to handle larger boats. Diesel- (now sometimes electric-) powered Narrowboats are a very popular mode of travel (and accommodation) on the inland waterways of England. Sailboat racing can be done on conventional family sailboats racing under one of the simpler handicap formulas (PHRF, or Performance Handicap Rating Formula is one such rule), or can be done on specialized boats with virtually no accommodation or compromises for comfort. Racing is generally either one design, where the boats are close to identical, or handicapped where the boats' finishing times are adjusted based on their predicted speed potential. Racing is further broken down into ocean racing, where boats start at one port and race in the ocean and back to the same port or a new destination, or buoy racing where boats race around prescribed courses and return to port at night. Several famous races cross oceans, like the biennial Transpac Race from Los Angeles to Honolulu, or the Newport-Bermuda Race  from Newport, Rhode Island to Bermuda. Other races actually circumnavigate the globe, like the Volvo Ocean Race or Vendee Globe race. Anchoring a boat is essential to recreational boaters by giving them the ability to park their boat in the water. Anchoring is helpful to boaters who fish or swim off of their boat and provides a stable and established site to achieve whatever activity is being done. Anchoring a boat is also critical in emergency situations and is a good safety measure whenever a vessel becomes disabled. There are three types of anchors, the Plow-style, the Fluke-style, and the Mushroom anchor. Plow-style is the most effective for most boats especially larger boats (over 26 feet (8 m)). It receives its holding power by plowing into the bottom sediments using the boats mass to drag it underneath the soil. Fluke-style or Danforth anchor is similar to the plow anchor but is more lightweight. This anchor is commonly used on boats smaller than 30 feet (9 m) but is very effective by using its pointed flukes to bury into the sediment below. Mushroom anchors are designed for situations which require a permanent anchor with strong holding power. The weight of a mushroom anchor causes it to be slowly buried under soft sediment, giving significant holding power and are typically used for moorings, buoys, and other permanent anchoring needs. Mushroom anchors are not carried on a boat for use as a temporary or short term anchor. Initially there is no holding power due to the significant amount of time required for the anchor to settle and bury itself in the sediment. A rope anchor line should be at least seven times longer than the depth of the water in the anchorage. A seven to eight foot chain should also be attached between the rope and the anchor in order to reduce the angle of the pull on the anchor facilitated by the chain sinking and lying on the bottom. This is important because in order for the anchor to be effective, the pull must be at a shallow angle rather than vertically. A vertical pull on the anchor will result in the anchor breaking out of the bottom sediment and is used as a technique to break the anchor's hold allowing the anchor to be raised in order to leave the anchorage. The anchor should never be dragged behind a boat or dropped at the stern. This could result in the boat being swamped or filled with water. Tie off the anchor to a bow cleat and pull on it to make sure that the knot is secure. After that make sure the vessel is down wind or down current of the anchor. After anchoring it is important to check visual sightings and onshore objects or buoys to let the driver know if his boat is secure by the anchor.The anchor will help you to stay in your current position on the water. If used correctly it is a great tool to use while boating. The smallest boats and kayaks may simply be carried by hand or by lashing them to the top of an automobile. Most smaller boats are stored at home and carried to the water on boat trailers, where they are floated from launch ramps leading down into the water. Some marinas will also offer electric hoists that can lift a boat from a trailer and swing it into the water (generally less than 3 tons). Larger boats are kept at marinas, which offer a mooring protected from the weather and a variety of support services, such as fuel, equipment and so forth. A more recent form of storage is rack storage where runabouts are stored in large steel racks, sometimes four or five boats high, and perhaps 25 boats across. These racks are housed in sheds, and large specialized fork trucks are used to lift the boats from the racks and place them in the water. This reduces the amount of space needed for boat storage, and also provides a clean environment in which the boats are housed. Some marinas will offer dry storage yards, where boats on trailers or dollies are stored on a hard surface. Many yacht clubs will offer a fenced area where boats are conveniently stored near the water, but without the maintenance associated with continual water storage (bottom growth, etc.) Boats in dry storage areas are either ramp-launched or hoisted into the water. Other items might seem obvious but are not actually required by law. They include a flashlight, first aid kit, paddles, whistles, anchor and rope, engine spare parts, bilge pumps, a VHF radio or mobile phone, etc. plaques which list the penalties associated with pollution due to oil discharge, or dumping trash overboard. In the United States, more than 40 states have educational requirements for operating a boat or PWC on state waters. Laws vary by state so it's best to check the laws of your state. Boater education courses can be taken in-person classroom style or online at the student's convenience. Credible courses are recognized by the US Coast Guard, approved by NASBLA and work in conjunction with state agencies. 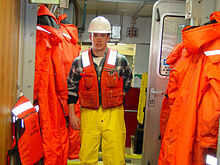 Commercial fisherman wearing a PFD with pockets among other safety equipment. Likely pocket contents: A whistle (on the lanyard, left side), dye packet, shark repellent, strobe light and pen knife. A mini-flare is clipped to the 'vest' on the user's left lapel. Recreational boating deaths could be dramatically reduced with increased use of Personal flotation devices (PFDs) or life jackets. Wear rates in 2003 were around 22.4%, although state and federal laws requiring children to wear flotation were more common, and therefore children's wear rates were much higher than those for adults. Relatively few children die in boating accidents; the more likely victim is an adult male in the mid-afternoon in a boat (under 20 feet length overall) who is not wearing a PFD. While various strategies have been devised in the last few decades to increase PFD wear rates, the observed rate has been relatively constant. This has led to the possibility of legislation requiring PFD usage on boats under a specified length when underway. Personal watercraft, or PWCs, have increased in popularity for the last 15 years, and account for about 70 fatalities per year (2002). However, PWC operators commonly wear PFDs, and therefore have a relatively low incidence of drowning. Trauma, largely due to collisions with other vessels and the shoreline, accounts for 70% of PWC fatalities while drowning accounts for about 30%. PFD types as defined by the U.S. Coast Guard such as Type I, Type II, Type III, Type IV, and Type V can be found at the U.S. Coast Guard. In the U.S., one PFD MUST be available for everyone on board. Life jacket definitions for the UK Coast Guard. In the United States, approximately 700 people die every year as a result of recreational boating accidents, according to the Boating Accident Reporting Database, published annually by the U.S. Coast Guard. Since 1970, when recreational boating deaths in the U.S. peaked at about 1700 per year, the annual rate of fatalities has been declining at a rate of about 2% per year. The majority of these deaths (70%) occur due to drowning, and are frequently associated with small powerboat accidents. Other causes of death include trauma (especially with small powerboats), fire, carbon monoxide poisoning, and hypothermia. The cause of the reduction of deaths is subject to some debate, but the Federal Boat Safety Act in the 1970s required that boats under 20 feet (6.1 m) be equipped with level flotation. This change in boat construction meant that boaters who found themselves in the water next to a swamped boat could climb back into the boat and both reduce their likelihood of drowning, while increasing the size of a search target and reducing hypothermia. Other frequently named causes include improved boater safety education, increased use of life jackets, and improved boating safety gear. Another potential cause for drowning is the presence of stray electrical power from a boat leaking into the water. This is known as electric shock drowning. Metal surfaces of a boat leaking power into the water can create zones of high-energy potential. Stray current entering salt water is less of a problem than the same situation in fresh water. Salt water is a good conductor and it carries current away to ground quickly. Fresh water is a poor conductor and when alternating current forms an electrical potential near a boat, the current can paralyze a swimmer. Stray electric current has caused many drownings, but post-mortem examinations will not link this problem to the death. The problem can be reduced by prohibiting swimming near boats connected to shore power and ensuring marinas comply with National Fire Protection Association Standard 303 for marinas. In the early 2000s, several high-profile deaths due to carbon monoxide poisoning (CO) led to increased scrutiny of boating habits (especially the practice of towing participants immediately behind a boat, known as "teak surfing" or "platform towing") and the implementation of various warning placards to educate boaters of the hazards arising from these activities. Other CO-related deaths were attributed to high concentrations of CO gas from houseboat generator exhaust, where swimmers were able to access an area near the stern of the boats that collected the exhaust. This has led to improved pollution controls on modern generator sets, and changes in the designs of houseboats so that they discharge exhaust gases in a way that they can dissipate. The increased use of CO detectors, especially in boats with enclosed accommodation spaces, and a proper assessment of boat manufacturers, would help reduce the risk of CO poisoning. Depending on the country, boating on coastal waters and inland waters may require a licence. Usually, commercially boating on coastal waters almost always requires a licence, while recreational boating on coastal waters only requires a licence when a certain boat size is exceeded (e.g. a length of 20 meters), or when passenger ships, ferries or tugboats are steered. Boating on international waters does not require any licence, due to the absence of any laws or restrictions in this area. Some of the member states of the United Nations Economic Commission for Europe issue the International Certificate of Competence. ^ "Tranpacificyc link to TransPacYC.com". ^ "Newport Bermuda Race". Newport Bermuda Race. ^ "Boat Ed® - Official Boating License and Boater Safety Courses". ^ "Inland waterways: categorisation of waters". ^ "Accident Statistics". U.S. Coast Guard. Archived from the original on 2013-08-14. Retrieved Sep 3, 2013. ^ Barss, Peter (2011). "Boating Immersion and Trauma Deaths in Canada: 18 Years of Research" (PDF). Transport Canada and The Canadian Red Cross Society. ^ "CDC - Carbon Monoxide Dangers in Boating - NIOSH Workplace Safety and Health Topic". ^ "International Certificate for Operators of Pleasure Craft - Resolution No. 40, Revision 1" (PDF). ECE/TRANS/SC.3/147/Rev.1. Geneva: United Nations Economic Commission for Europe, Inland Transport Committee, Working Party on Inland Water Transport. October 16, 1998. See section Recreational Navigation. Retrieved 2011-03-11. Doane, Charles J. (2009). The Modern Cruising Sailboat: A Complete Guide to Its Design, Construction and Outfitting. McGraw-Hill. ISBN 978-0-07-147810-6. Look up boating in Wiktionary, the free dictionary.